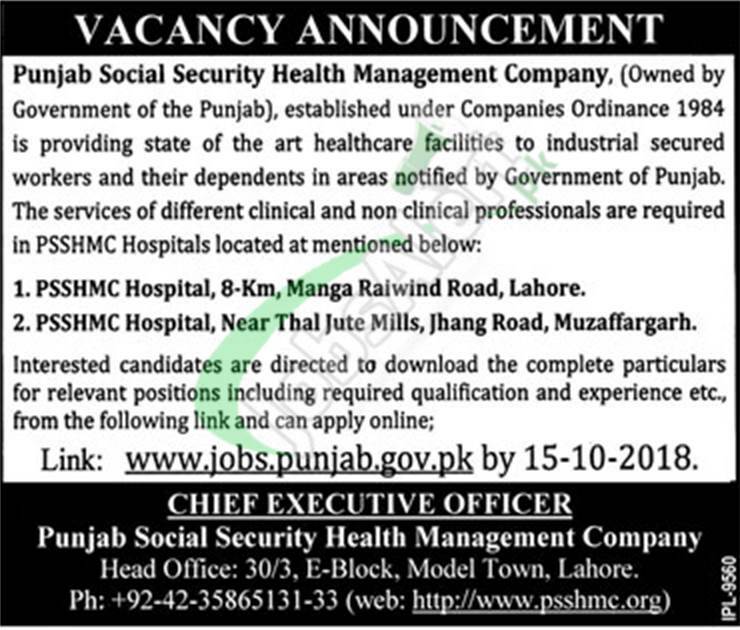 Punjab Social Security Health Management Company PSSHMC Jobs 2018 Lahore Muzaffargarh Apply Online | www.jobs.punjab.gov.pk for the vacancies Medical Specialist, General Surgeon, Anesthetist, Nephrologist, Pediatrician, Medical Officer, Database Administrator, Staff Nurse. Candidates wanted to apply should possess MBBS/MCPS/FCPS/MCS/BSc Nursing/Matric General Nursing & Midwifery Course. Candidates meeting criteria should apply via online at www.jobs.punjab.gov.pk before the last date 15th October 2018.